Dipped shea butter and teeming with our decadent blended formula, our Truffles are suited for the most elegant, calming baths. 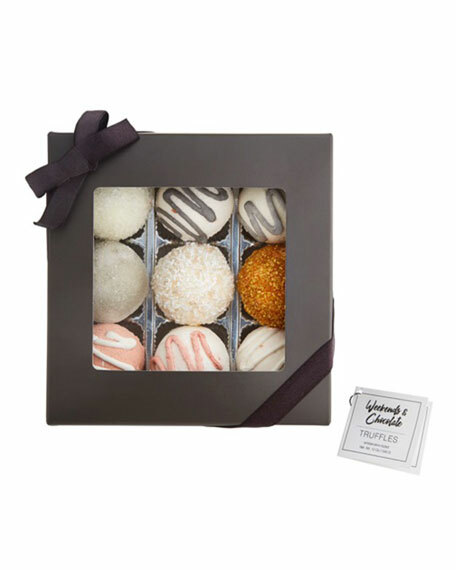 Presented in a clean slate box, these Truffles are moisturizing and soothing to the skin, senses and mind. Contains a curated blend of eight moisturizing oils, including Avocado and Coconut, and shea butter. Unique mixture creates foaming result in the tub. Deeply nourishes and moisturizes the skin with nine unique fragrances. Boxed set of six; total nt. wt: 12 oz. / 340 g.
For in-store inquiries, use sku #2435424.